The teams are in for the Premier League clash between Everton and Chelsea today, the Blues need to come away with a win if they’re serious about finishing in the top four. The Blues will be looking to play with much more intensity than they did against Wolves last weekend, the west London club rescued a point in the last minute thanks to a last-gasp equaliser by superstar Eden Hazard. Maurizio Sarri has made two changes to the side that drew against Premier League new-boys Wolves last weekend, the Italian has called left-back Marcos Alonso back into the team – in the place of Emerson. Sarri has also switched out Mateo Kovacic for one-time Everton golden-boy Ross Barkley – the England international was one of the best players to come out of Everton’s academy but his reputation was tarnished when reports suggested he pushed for a move away from his boyhood club to Chelsea. This is a massive game for Barkley, now is the time to prove himself. Eyes will also be focused on striker Gonzalo Higuain today, the Argentinian needs to show his sharpness, otherwise fans will call for a chance to be given to Olivier Giroud – the Frenchman scored a hat-trick in the Blues’ Europa League clash on Thursday night. 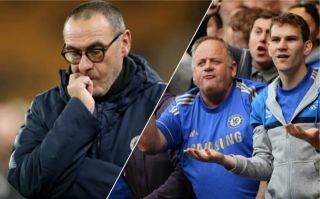 These Chelsea fans weren’t very pleased with Sarri’s team selection, from the outside looking in – it seems as though the Blues are too predictable with their lineups and more importantly Sarri still hasn’t nailed down his best players in certain positions. It feels as though Barkley and Kovacic are stuck in some kind of revolving door, you’d think that Sarri would know which player was better at this late stage of the season. Barkley starts. I’m done with this club. Today’s clash is crucial for the Blues, they have the chance to move onto the same points as fourth placed Arsenal. If Chelsea are to have any hopes of finishing in the top four they will need to win today and against a team that has won just one of their last six games, fans will be expecting a dominant performance.